As the film industry prepares for the Bafta film awards on 23 February, BBC News Online looks at the ceremony's recent attempts to compete with the Oscars and whether its efforts have succeeded. So, the nominations for the Oscars are in and all eyes are on Los Angeles, where the big awards ceremony will take place on 23 March. But before the star-studded event in the US, there is the small matter of the Bafta film awards in London on 23 February at the Odeon, Leicester Square. Only, these days, the Baftas - or the British Academy of Film and Television Arts awards - are no longer the poor relations of their Californian counterparts. Nicolas Cage, Daniel Day-Lewis and Martin Scorsese are flying in for the awards. They will be joined by Nicole Kidman, Meryl Streep and Julianne Moore, the three stars of the acclaimed movie The Hours. In recent years, the Baftas have attempted to give themselves what could be described as a Hollywood make-over. They have shed their stiff British upper lip image and moved their placing in the awards calendar, all in an effort to counteract the swamping effect of the Academy Awards. Bafta's chief executive Amanda Berry says she anticipates 2003's event to build on this recent trend. "The awards have gone from strength to strength in recent years," Ms Berry commented. "Last year the event was attended by more nominees than ever before, proving how highly they regard the event and a worldwide audience of over one billion people watched the programme." Now in their 54th year, the Baftas can claim to be among the "must-be-seen-at" celebrity events of the year. And, in the wake of actor Russell Crowe's misbehaviour last year, they can even claim the cachet of celebrity controversy. It is all a far cry from the event's humble beginnings in 1949, when academy members voted sheepishly for a mere two categories of award. In subsequent years, more honours were added and awards for television were brought in. Mixing film with TV was thought by many in the movie industry to weaken the status of the Baftas further, particularly in the US. True, a similar ceremony in the US - the Golden Globes - holds a lot of sway. But winning a Globe for film is no match for an Academy Award. The Baftas also lost credibility by their almost belligerent insistence on rewarding British movies with the top award of best film. 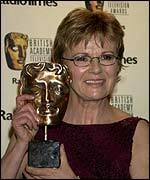 In 1998, Bafta showed signs of upping the ante of its film awards when it separated the ceremonies for film and television. 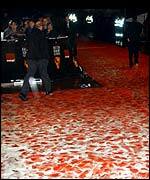 But the truly ground-breaking initiative came in 2001, when Bafta announced it was moving its event ahead of the Oscars. The Baftas had always been held at least two weeks behind the Oscars, when the stars, media and public were worn out by film awards. Now, the Baftas hold a strategic position just after the Oscar nominations, and almost a month ahead of the awards in LA, when excitement is increasing by the minute. Simon Relph of Bafta said in 2001: "As the film awards continue to grow... we believe this is the right time to move the film awards. "As a platform, the new date will undoubtedly attract even more international talent to the ceremony, increasing its stature and influence considerably." Indeed, the effect has been huge, with formerly reluctant, even stand-offish, US stars eager to be seen and so grace the Baftas with their presence. And where big Hollywood stars gather, so do the world's media and the crowds of fans. Another unexpected bonus has been a good dose of controversy to spice things up further. Russell Crowe - winner of the best actor Bafta for A Beautiful Mind - caused a rumpus when he got shirty with a TV executive after the show. 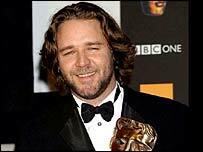 Crowe was upset that the recording of his acceptance speech, in which he read a poem, was edited down for UK TV. Crowe, although not nominated this year, has been asked back - so interest in the ceremony is guaranteed. But, whether the British film industry has, or will, benefit from the Baftas' increased visibility is still very much open to debate. Even in the UK, box office success is more influenced by the big promotional campaigns only US film companies can afford. And, there is no strong evidence that the Baftas have any sway over the voting members of the Academy of Motion Picture Arts and Sciences. For example, the Lord of The Rings picked up Bafta's best movie gong, as opposed to Ron Howard's Oscar-winning movie, A Beautiful Mind. And, while its star Crowe triumphed at the Baftas, Denzel Washington was honoured at the Academy Awards. Simon Crook, assistant editor of Total Film magazine doubts Bafta has any real power. "Aggressive studio lobbying still appears the most powerful indicator of what movie's likely to luck out at the Oscars, not what the British Academy have deemed award-worthy," Mr Crook says. But he adds: "When it comes to kudos, at least the British Academy has better or at least more singular tastes: Oscar denied Goodfellas a best picture gong, the Baftas didn't. Amelie was also rewarded last year while Oscar more or less ignored it." When it comes to glamour, however, Bafta will never come near to Hollywood standards. Things are a lot better than a few years ago, when the Baftas were held amid the bleak concrete confines of the Islington Design Centre in north London. But Bafta can do nothing to compete with the grandiose surroundings of the Kodak Theater in LA - or its glorious weather. Last year, the film industry braved torrential rain and a red carpet that tuned into a soapy bog. Mr Crook concludes: "For all the efforts, glitz is something the British film industry has developed a profound allergy to."